Irish actress Saoirse Ronan will lead the cast for the screen adaptation of ‘The Host’, the latest from ‘Twilight’ writer Stephanie Meyer. 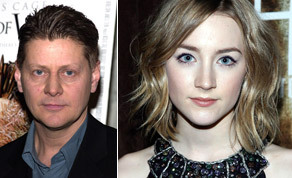 Writer Andrew Niccol (The Truman Show) has been announced to direct. Niccol has already adapted the screenplay for ‘The Host’ and was reportedly personally chosen by Meyers to take on helming duties for the anticipated pic, which is being shopped by producers at Cannes. Niccol, who wrote and directed the 1997 film ‘Gattaca’ and whose screenwriting credits include ‘The Truman Show’ and ‘The Terminal’, recently wrapped filming for sci-fi thriller ‘Now’ with Olivia Wilde, Alex Pettyfer and Irish actor Cillian Murphy. The story of ‘The Host’ revolves around the takeover of Earth by an alien race known as Souls. 17 year old Ronan, who is currently starring as teenage assassin in Joe Wright’s ‘Hanna’, will play both human Melaine and alien invader Wanderer in the film. Producers for ‘The Host’ are Nick Wechsler (The Road, The Time Travellers Wife) and Steve and Paula Mae Schwartz (Serena). Inferno's Marc Butan, Jim Seibel and Bill Johnson are exec producing.